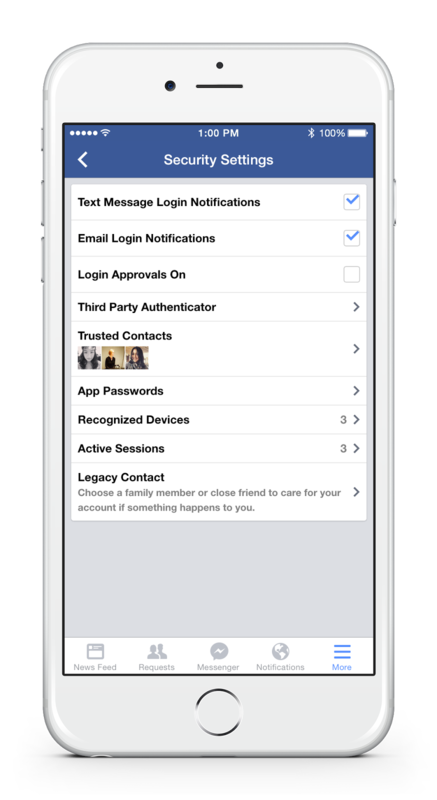 Today, Feb. 12th, Facebook announced a new service: the possibility of Adding a Legacy Contact. April 30th 2015 update: This is now active in Canada as well as in the USA. May 12th 2015 update: featured in Australia, New-Zealand and Japan. July 27th update: available now in the UK too, and thanks Michael Diamond. August update: available now also in Finland and Denmark. Thanks Stine Gotved and Anna Haverinen for letting me know. September update: Now available in Israel too. 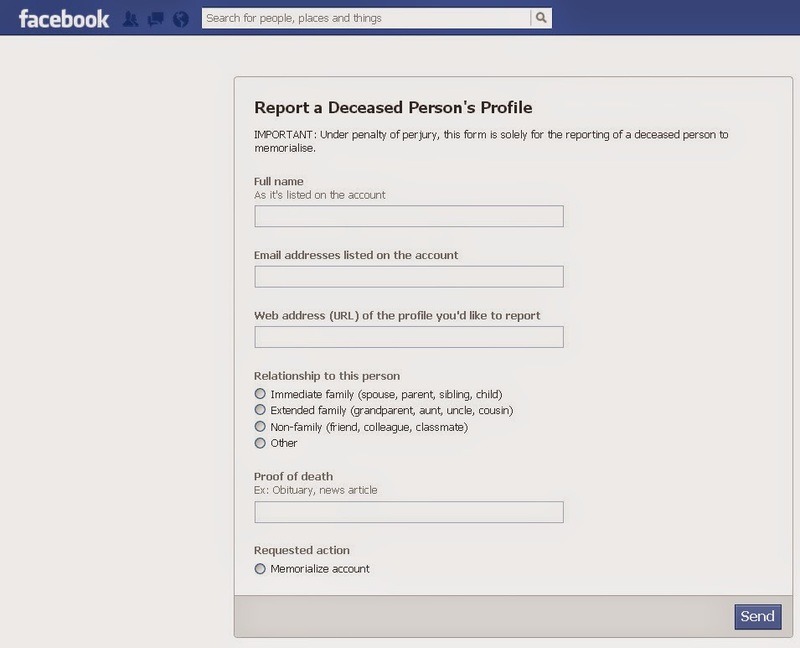 Alternatively, people can let us know if they'd prefer to have their Facebook account permanently deleted after death. 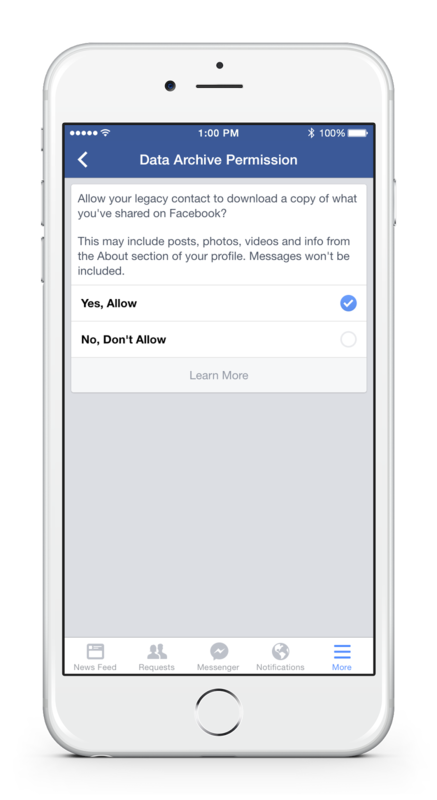 You may give your legacy contact permission to download an archive of the posts, photos and profile info you've shared on Facebook. We're introducing legacy contact in the US first and look forward to expanding to more countries. Setting up a legacy contact is completely optional. 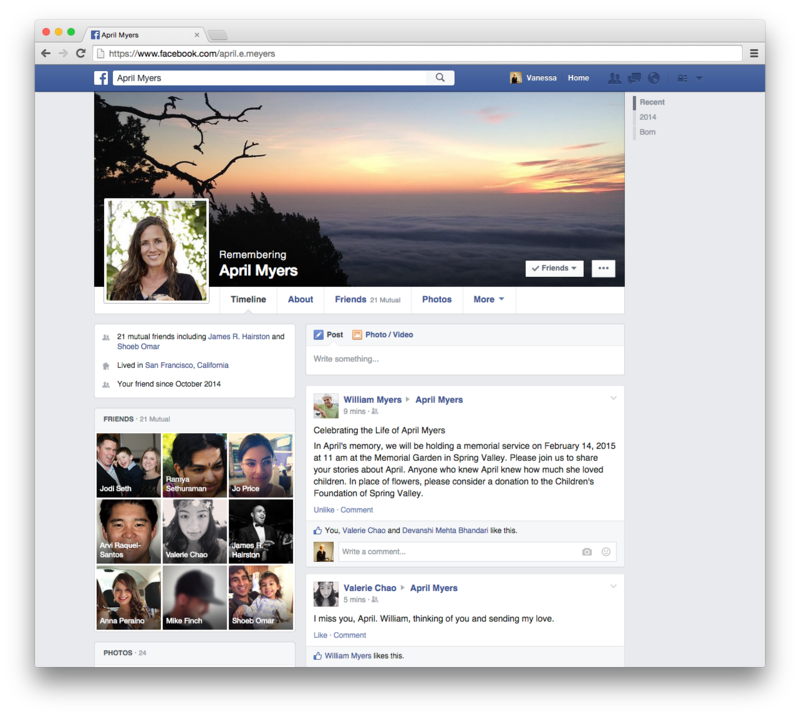 Our team at Facebook is grateful and humbled to be working on these improvements. We hope this work will help people experience loss with a greater sense of possibility, comfort and support". a post created and pinned by the Legacy Contact. My first reaction is - Yay! Wow. A definite improvement to the existing (non-existing) Facebook policy in this regard. Facebook is the second company to offer an in-house solution: Google was the first, in April 2013, with her 'Inactive Account Manager'. You can read more about it in my posts here and here. Many websites offer options to manage your digital legacy - a list can be found in this post of mine here. (Actually it's the second-and-a-half company if we were to count Yahoo! Japan's service as well). Q: What about pages the deceased was an Admin to? Will the Legacy Contact have access to those as well, even just to appoint another Admin? I hate seeing valuable content - of both sentimental and financial value - lost over an account being memorialized, when another Admin hasn't been appointed before or after the death of the sole admin of a page. A: No, the legacy contact only applies to personal profiles at this time, but it is something we will certainly think about as this evolves. Q: Has anything changed regarding what happens to an account of a person who dies without nominating a Legacy Contact? A: Our current memorialization policies applies: someone can request the page be memorialized (viewable, but not managed by anyone), and the family may still request the account be deleted. Q: Will users be prompted to sign up for this service? A: They will not. We have posted information in our newsroom and hope that and the media coverage will encourage people to sign up as they see fit. Q: I'm uncertain about tagging: can someone be tagged in a picture or a post once their account has been memorialized? If so, then: can the Legacy Contact control those tags? For instance, if a deceased person was tagged in an ad or something else which is unsuitable or inappropriate, can the Legacy Contact untag the deceased? (I didn't see any tagging reference here). A: Memorialized accounts can be tagged, and whether or not the tag shows up to friends depends on the settings they had during their life. 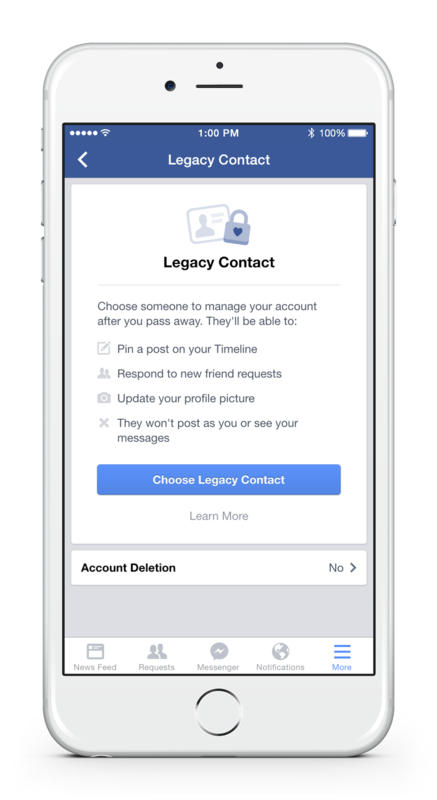 Legacy contacts cannot currently untag, but they can reach out to the person who tagged the deceased person and ask that they remove the tag. And anything that goes against our Community Standards can be reported and we would review and delete as appropriate. Q: Will the Legacy Contact have permission to delete posts from the timeline after the account has been memorialized? For instance, if hurtful, un-kind posts were posted, could the Legacy Contact remove it? A: No, we have a reporting process, which would allow people to report anything they feel violates our terms of service and Facebook would review and delete those things. Q: It states that the Legacy Contact can "Respond to new friend requests from family members and friends who were not yet connected on Facebook": how about a "Follow" button, if the deceased hadn't set one himself/herself while he/she were still alive? Could the Legacy Contact add a "Follow" button, for people who would not wish the befriend the deceased but would like to follow, for example? A: No, a legacy contact could not add a follow button. Q: Will the Legacy Contact be able to write a post on the timeline of the deceased and pin it there even if the "Who can post on your timeline?" settings was set to "only me" at the time of the death? If the timeline was set to "only me", will the Legacy Contact be able to change that to "friends", in order to allow the friends and family members of the deceased to express their grief there? A: A legacy contact could not change the settings that the account holder had in life - so if the person did not allow anyone to post on his or her timeline in life then the Legacy Contact could not change that after death. Q: Could the Legacy Contact position be revoked or transferred? For instance, if a couple breaks up, could they revoke the position they have previously appointed to their former spouse, and/or transfer the position to their new spouse? A: Yes, a person may change their legacy contact as often as they like before death. 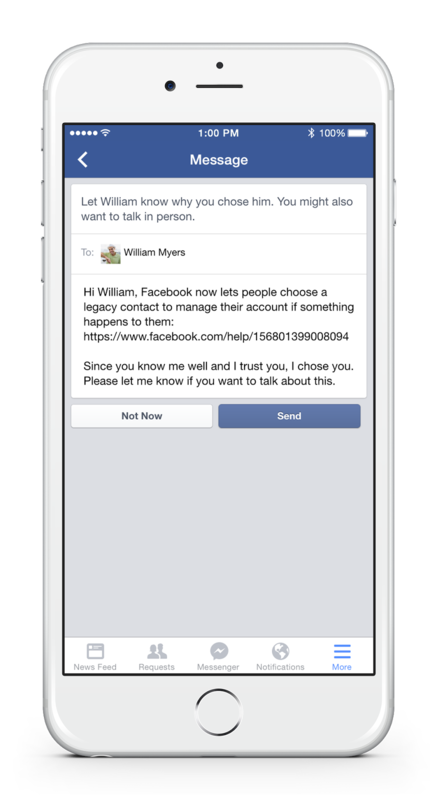 Q: Has the policy changed regarding who can notify Facebook about a death of a user and/or how that notification is made? I find the current policy, of anyone being able to report anyone, and that all that is required is a link to an obituary, troubling. This is what a form to 'Report A Deceased User' used to look like and this is what a 'Memorialization Request' looks like now. Does it only LOOK different, or is there a change of policy too behind the change in appearances? A: Anyone can request memorialization, but it is verified by our community operations team who thoroughly reviews each request – we ask for an obituary or news article, but we also use other social cues to verify that the request is legitimate. We have very low rates of false memorializations. 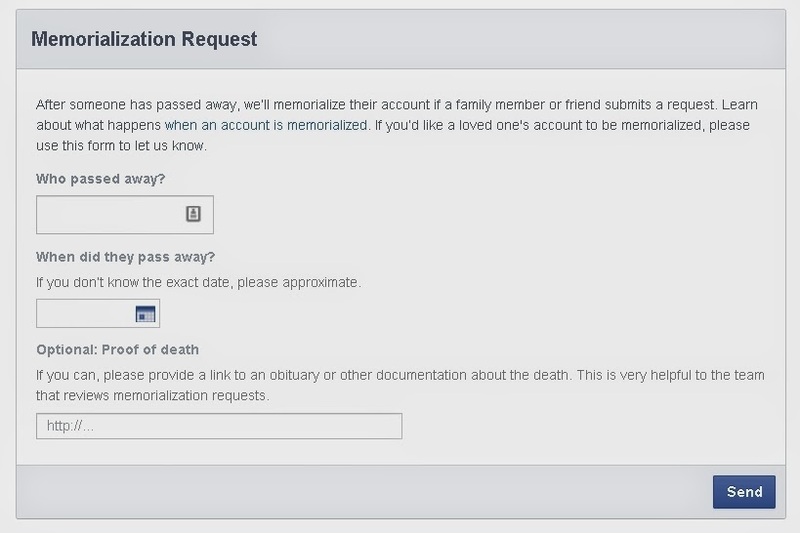 Deleting an entire account after memorialization can only be requested by immediate family and that requires a death certificate. Memorialization requests are handled the same way. October 2015 update: I wrote a separate post, explaining why I don't think this is a good and comprehensive enough solution, although it is an important step in the right direction. Jed Brubaker is a PhD candidate in the department of Informatics at UC Irvine. Facebook involved him in this project as an academic collaborator, to share findings from his six years of researching death and grief on social media, and to provide feedback and guidance during the design and development of Legacy Contacts. Does a legacy account heir need to be on the persons facebook as one of their friends?